A water mix, base compound designed for use where floor levels need to be raised quickly and economically. Suitable for pump application. 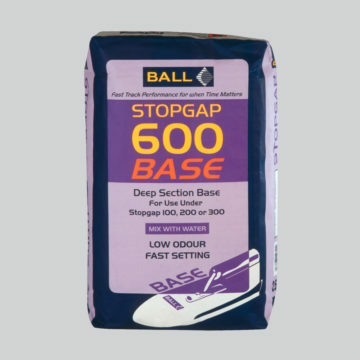 Stopgap 600 is self-smoothing, dimensionally stable and fast drying, it should be capped with Stopgap Fast-Track 30, Stopgap 200, Stopgap 300, Stopgap 800 or Stopgap 1200 PRO smoothing underlayments. Designed for application up to a maximum of 50mm and a minimum of 5mm, to provide a sound base. Typically 900m² of Stopgap 600 at 5mm thickness can be pumped per day. Suitable for both absorbent and non-absorbent subfloors.